Pictures posted to Instagram, Streamzoo, EyeEm… Facebook, Twittter… well, you know, social sites. Can at times have text on the photo saying things like a cute message, the location or the weather at where the photo was snapped. Looking around, I did find a fun little app that automatically adds location, city or county info right on the iPhone snapshot. 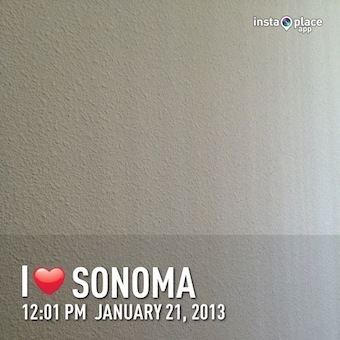 Instaplace accepts a photo from the iPhone photo library or one taken through the app. 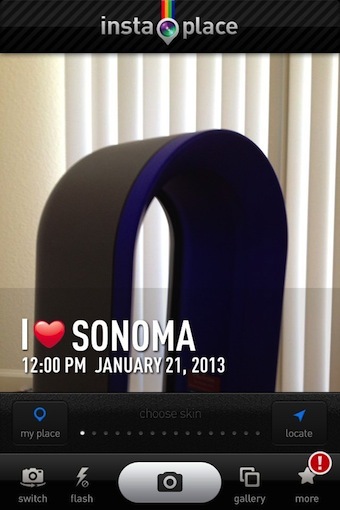 Using the app’s camera, snapping a shot is done through the viewfinder with the text showing. 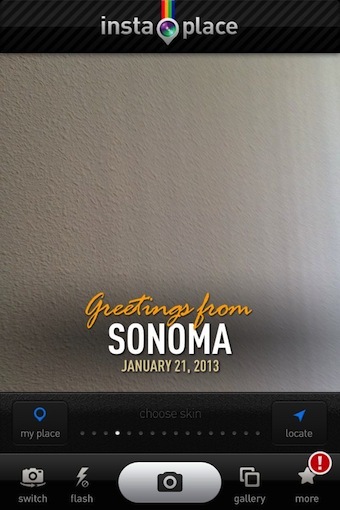 Two buttons will help tell the app to pull data for the photo; My Place and Locate. Swiping across the Instaplace screen, you can view the different text options, notice the ‘Chosen Skin’ and dots showing which option is chosen. The photo can be saved to the iPhone photo library without any text. Then, save/share the photo with the text. 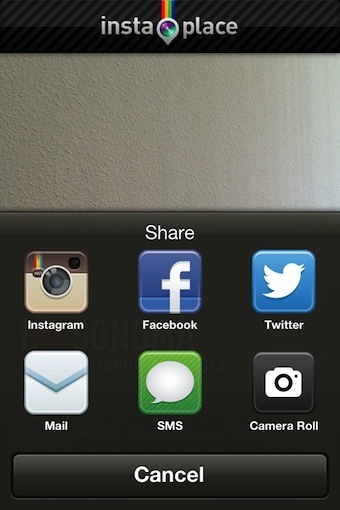 Photos are shared directly through the app to a few of the top photo social sites. Attaching to a email is a fun way of keeping the message personal, not all sharing has to be public through the major player options. The Instaplace settings allows for turning on/off a few features. Saving the initial photo taken, saving the photo shared and allowing the app to install their logo in the upper right corner… or not. Personally, when I pay for an app, they don’t get to use me to advertise their app.